Sorry this one’s a bit late, took me a while to sort this one out this week for some reason. Got the tasting to do tonight, just in time to start up Week 39 next week. So going to keep this one simple. 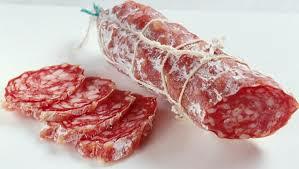 Long and short I’ll be going for salami and cooked meats again. Maybe a bit of bread and balsamic to finish it off. It’s a full bodied, fruity, and peppery wine that I’m expecting, there’s few things that’d go better with it. I also don’t spend all that much time drinking Rhône valley wines, so quite looking forward to just concentrating on the wine this week. A good taster tonight and a quick “how it went” tomorrow before we crack on with the next week. #NWTW Week 38: It Ain’t ‘Alf Hot, Mum! #NWTW Week 38: Apparently, They Love It! Yummy- nothing like a good, classic pairing such as salami and wine! I love a bolognese with Cotes-du-rhones. Will have to give the salami a try! ← #NWTW Week 38: Apparently, They Love It!